Good morning from Amsterdam! I’m currently sitting down with a cup of tea looking at the first blue skies I’ve seen all week, hurrah! I’m here for a really exciting project but will be sharing more on that in April so stay tuned. For now, let’s eat! 4 ingredients. Creamy, nutty and rich in raw chocolate flavours from the naturally-sweet carob powder. 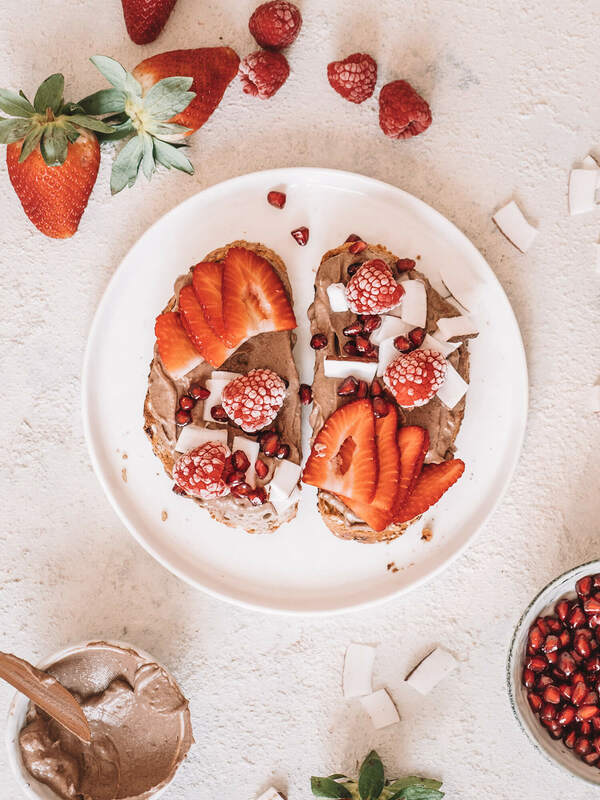 Perfect to spread on toast but equally as good to smear over fruit slices and just about anything that needs a yummy hit! This is a mismatch of the two; the perfect savoury and sweet combo. 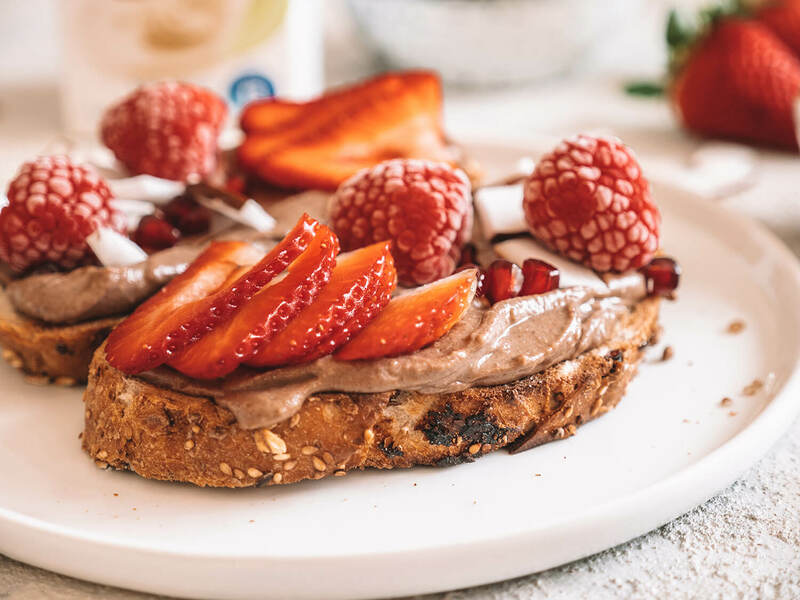 Toasted wholegrain bread smeared with the cashew nut butter and topped with all things fruity. 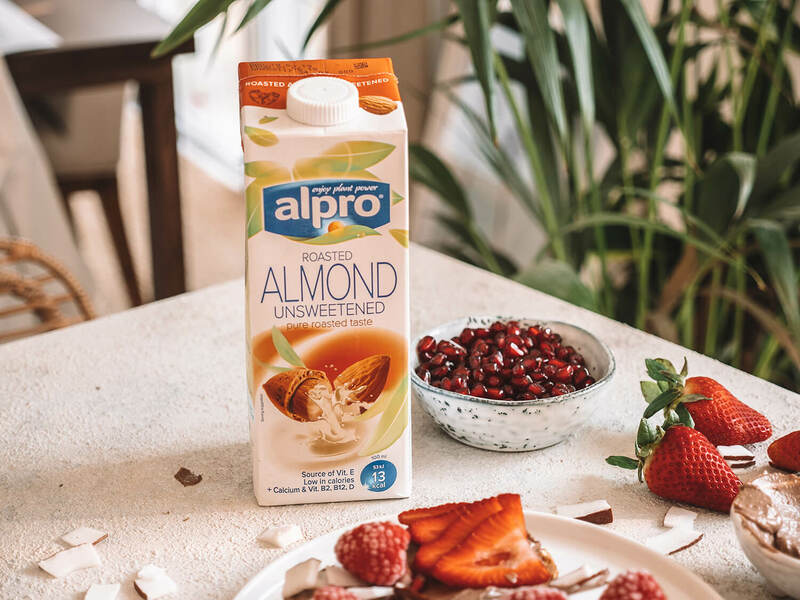 Another one of my recipes using the delicious Alpro nut drinks (this time the unsweetened Almond drink) which adds a world of creaminess to the nut butter. You can also use blanched almonds instead of cashews as the nut base if you prefer. Put the dates in a cup and fill with water until just covered. Place the cashews in a separate bowl and pour in the ½ cup almond milk. Leave overnight or for a min of 3 hours. Drain the dates and the cashews and then add everything to the high-speed blender until smooth. You may need to use a spoon or paddle to give the mixture a stir halfway through. Keep covered in the fridge for up to 4 days. By Carly Neave, March 17, 2019 Hello and welcome! I'm Carly, originally from London but currently enjoying a little adventure in Dubai. A travel and wellness blogger exploring the world one step at a time. Think fabulous food at undiscovered gems, unique destinations, skin care obsessions and so much more. This is my life, I hope you enjoy the ride!